It is of course very difficult to study emotions in large marine animals such as whales. However, an incredible story of a whale rescue and the response of the whale to her rescuers strongly suggests that the whale was experiencing emotions. The 45-50 foot humpback whale was on the migratory route around the California coast when she became terribly entangled in crab trap lines. Her life was at great risk. She was tangled up in weighted ropes up to 240 feet long wrapped around her tail, her flipper and even in her mouth. The ropes were so tight they cut into her blubber and caused visible wounds. The weight of the traps was pulling the 50 ton mammal down and causing her to struggle to keep her blow hole out of the sea. She was completely helpless. A rescue team of divers went out to her but she was in such a state they were unsure that they stood any chance of saving her. They realised the only way to save her was to dive into the water and cut the ropes. 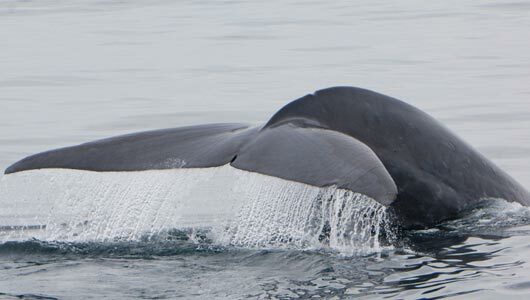 They were at risk themselves, as the flick of a humpback’s tail can kill a human. But they reported that as they worked to free the unfortunate creature, she did not struggle at all and they were aware of her eyes simply following them around as they worked. Thankfully, the rescuers were successful. They were then astonished by the whale’s heartwarming response. When she felt herself come free, she began to swim around in circles and then went up to each diver one by one and nudged them.